In case you were following along, a few more changes have gone in here, at this site, because here is where I have license to do things my way. This here site is now hosted on a small Vultr instance, which I’ve optimized pretty hard. I’m now using PHP 7.2 (FPM) and MariaDB instead of MySQL. Nginx is handling traffic in front of Apache. I’ve also got Varnish working as an HTTP accelerator, as well as WP Rocket page caching WordPress. In addition, there’s minification and concatenation on JS and CSS. Plus, images are crunched, and lazy loaded. As well as this, I’ve pulled the Google fonts this site uses to be served locally – and via a CDN – so that I can ask browsers to cache them way longer than Google asks. All static elements of this site are sent via AWS CloudFront, which is a really fast CDN service, and keeps things zipping around the world. This also provides some limited bursting potential (along with Varnish… and the rest of the above) meaning this site would be pretty robust under heavy load. 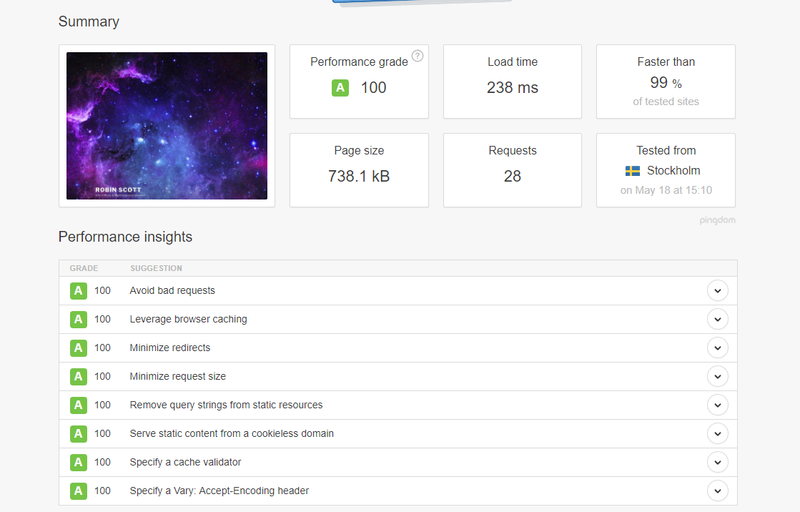 As a result, pages are loading very quickly, and the site scores the mythical 100/100. So its not mythical. I’ve seen several of these things described as “micro-optimizations” by developers working for very large companies. Perhaps they say this because they don’t do these things, so they seek to disparage the practice of being optimal? Who knows? I don’t really mind what their view is. In a mobile first world, speed is a ranking factor. My site is faster than most. And this is the point. Yours can be too – and on WordPress – don’t believe anyone who tells you otherwise.